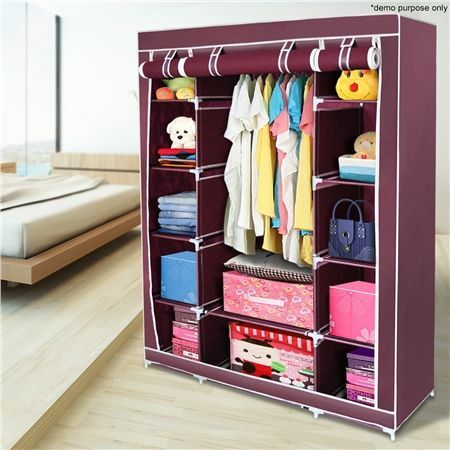 This Red 5-Level Non-Woven Cloth Storage Wardrobe is the just the thing to solve your space saving issues. This portable closet is great for seasonal storage and ideal as an extra space for hanging or folding clothing. The high quality steel frame and ABS connectors ensure this wardrobe is both durable and sturdy enough to hold your garments. Equipped with 11 cubicles and a hanging rack this closet can store jackets, shirts, pants, jumpers and dresses with no problem. Featuring 4 zippers that help your keep your garments free from dust, moths and dirt the flaps easily roll up to allow you to search for that one item without constantly having to move it out of the way. 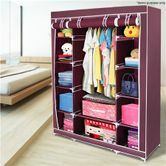 Great Storage Solution for Storing Clothes, Shoes, Books, Toys and more! Probably the only drawback of purchasing this order was the lack of instructions that came with it which is a bit daunting as the storage cupboard seems to have a million or so different bits and pieces needing to be assembled Youll need to set aside a decent amount of time for assembly definitely isnt a quick set up and I think if you tried to rush it youll definitely end up with structural errors.Once assembled the storage cupboard is amazingly sturdy has lots of useable shelf space and overall is much better quality than I was expectingIt is also made out of heavy duty materials therefore should last quite some time. it is large its going to fit all my clothes. colour is a little off but its fine for my needs.it is very annoying to put it together but worth it.be careful putting the cover on it will rip.